These five volumes represent a five-year project for me. Not having name recognition myself, we are believing God for a publisher to catch the vision, see the need for this type of material to be taught in the churches today, and be willing to put their name on it. 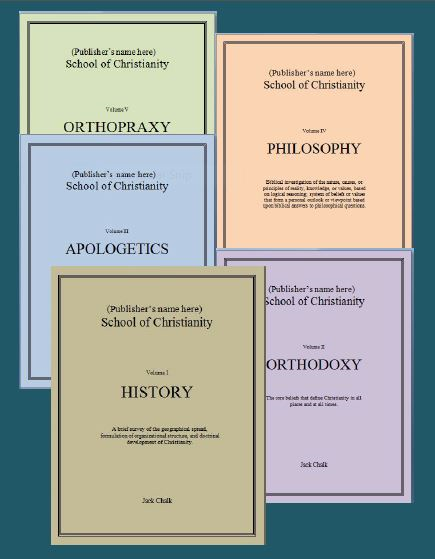 Under the direction of a publisher, a workbook will be prepared from these volumes that is to be used by participants in an all-day session or several two-hour sessions taught in local churches. A leader’s guide will be provided and anyone with the gift of teaching can teach the course. Anyone interested in more information on the subjects can purchase the books. The volumes are from 90 to 140 pages in length. Having been in many churches in the US, Latin America, Africa, and Europe, I have observed one common characteristic of church members everywhere. People know Jesus Christ as Savior, but, unless they have been to a Bible school or seminary, they know very little about Christianity or Christendom. They have stepped into a stream that has been flowing for 2,000 years and has not always looked like it does today. Other than salvation in Christ, most do not know the other key doctrines of the faith that Christians everywhere and at all times need to believe (the Apostles’ Creed is used as an outline). They do not know the facts that support what we believe. They do not understand the complete biblical worldview and why it is the only worldview that answers the key life questions: “Where did I come from?” “Why am I here?” and “What is going to happen to me when I die?” The answers Christianity provides make sense, they are comprehensive, and they are livable. They need help to live godly in an ungodly world. These volumes give them what they need in the language and at a level directed to the average person in the pew. These are not for the scholar. The rapid growth of Christianity during the last few decades has seen many people embrace the Christian faith without really knowing its full content. The initial reason to become a Christian is to accept the free gift of salvation through Jesus Christ, thus being set free from the power, pollution, and judgment of sin. The new life in Christ has its own history, purpose, and destiny that is different from the world and culture into which one is physically born. There is much Christians should know about their faith. Christianity has a true history. Christianity has facts to support its beliefs. Christianity has beliefs that are reasonable and consistent with reality. Christianity has beliefs that can be lived out in today’s world. It is the purpose of these volumes to present the basic content of the Christian faith in language and terms that can be easily comprehended by the average church member. In doing that, only the essential facts and beliefs of true Christianity will be presented, and not secondary issues that tend to divide. These essential facts and beliefs must define Christianity in all countries and cultures of the world. These volumes are divided by subjects in keeping with the purpose of the series. This entry was posted in To be Published on July 27, 2015 by Jack Chalk.